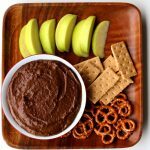 Make a chocolate dip that’s a little healthier using chickpeas! This is great as a dip for fruit and pretzels. Dried chickpeas can be cooked very quickly in the Instant Pot. Once the time is up move the valve to venting and remove the lid. Drain the liquid off of the chickpeas using a colander but reserve the liquid for later. Add the drained chickpeas, peanut butter, maple syrup, cocoa powder, vanilla and kosher salt to a blender or food processor. Add in about ½ cup of the reserved liquid. Blend until smooth and creamy. Add in more liquid if needed to get to your desired consistency. Serve the dip with apple slices, bananas, pretzels or graham crackers.